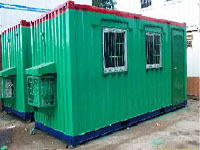 CONTAINERS: are ideal as site office, portable stores, labour camps. It can be lifted by an industrial crane and transported to any other site. These Containers are available in fully insulated and non insulated edition and are available in the size of 8ft. to 10ft. x 20ft. to 40ft. with ceiling height 8ft. to 9ft. Frame work of walls & roof: The frames are made with RHS (Rectangular Hollow Sections) of sizes 200, 100, & 50mm respectively. Walls & Roof to be cladded with trapezoidal corrugated MS sheets 1.2mm (18gauge) with inner layer of 8mm thick MDF board with 1.0mm thick laminate over it. Insulation to be provided of EPS (Expanded Polystyrene) 50mm thick for both walls & roofs. 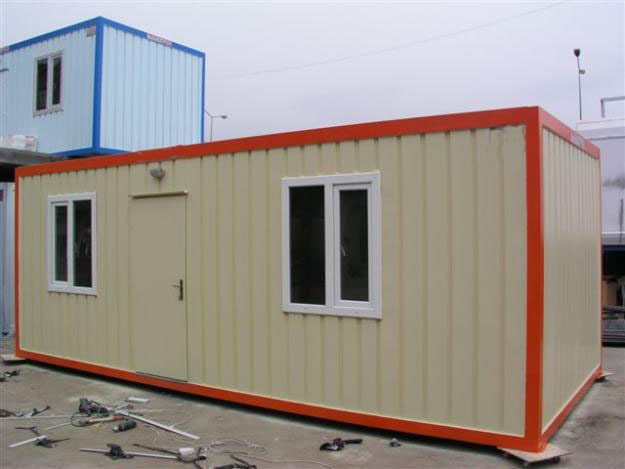 Any material to be used should be water, heat, termite proof & fire resistant with capacity of being comfortable in extreme weathering conditions. Frame work of flooring: The frames work is made with RHS (Rectangular Hollow Sections) of sizes 100, & 50mm respectively of size 600x600mm. Further cladded 18mm thick BWP ply finally on frame. Vinyl floor 1.5mm thick to be then applied homogeneously on the ply. Plain aluminum sliding 4mm glass with aluminum grill & mosquito jail & locking arrangements as specified in architectural drawing. 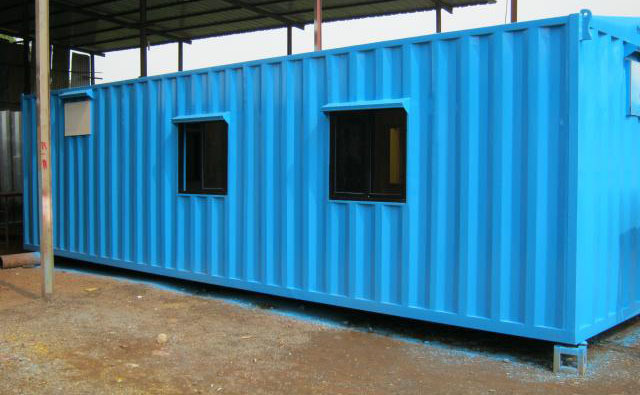 All the sloping type cabins should have proper rain protection arrangement above the windows. The flush doors of size 7ft.x3ft. with handle locks & L-Drops to locking arrangement. All the sloping type cabins should have proper rain protection arrangement above the doors. Electrical Work will be done according to layout shown in the architectural drawing. All G.I., C.I. & C.P. work will be done according to layout shown in the architectural drawing.